Although they look as if they're made from natural materials, our Montauk Kitchen Bins are woven from plastic, so they're extremely durable and affordable! Use these kitchen bins to organize packaged or canned foods, linens or serving utensils in the pantry. Square Montauk Kitchen Bins is rated 4.6 out of 5 by 13. Rated 5 out of 5 by anzatowndog from Bought one in each size The narrower width is good for a small bedside table or desk and the larger one if you have more space. The liners are nice and the fact they're made of woven plastic means they're attractive but won't shed over time. I'm very happy with them. Rated 5 out of 5 by Rm225 from Great basket! Really love this basket. I am using it to store medicine and vitamins that I like to keep on my nightstand. It looks great, so much better than having bottles everywhere getting knocked over. It's the perfect size. Highly recommend! Rated 5 out of 5 by baturb from Great for pantry - Very Durable We love these, and they look great in our pantry - Fit perfectly on shelves. We're buying more! Rated 4 out of 5 by nycshopper8 from Great Product I purchased 3 of these baskets all different sizes. It looks great and is made with good quality. 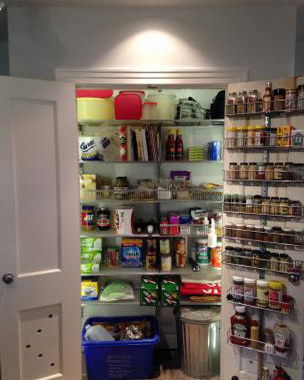 Great for use in storing kitchen items. Rated 4 out of 5 by BB20 from Good Product I purchased several of the oblong version of this bin. As an avid scrapbooker, I find them an attractive and handy way to store small items. They match my decor and look nice on the table. Rated 5 out of 5 by Chrisw30040 from Great for pantry Put a few of these in the pantry to help keep smaller bottles and pkgs organized. Rated 5 out of 5 by mleinart44 from Great Product - Versatile and Good Quality Great product. This works well in organizing just about anything. The liners are made of 100% Washable Cotton. Is the basket liner removable? Do these come in any other colors besides gray? Love the bin but not the gray, prefer tan. Currently, our Montauk Kitchen Bins are only available in grey.